January 24, 2011 – According to the Chicago Booth/Kellogg School Financial Trust Index issued today, trust in America’s financial system has increased significantly in the past two years. While the first issue of the Index from January 2009 revealed that 20 percent of Americans trusted the financial system in the wake of the economic crisis, two years later trust has reached nearly 26 percent. However, while trust and confidence are steadily increasing overall, today’s report also finds lingering discontent toward mortgage lenders. The new data shows that even people morally opposed to strategic default said they would be more likely to default on their mortgage loan if they knew their lender or bank had been accused of predatory lending. The Chicago Booth/Kellogg School Financial Trust Index is a quarterly look at Americans’ trust in the nation’s financial system, measuring public opinion over three-month periods to track changes in attitude. Co-authors Paola Sapienza, professor of finance at the Kellogg School of Management at Northwestern University, and Luigi Zingales, professor of entrepreneurship and finance at the University of Chicago Booth School of Business, published today’s report as the ninth quarterly update. The latest issue looks at the period covering October through December 2010. 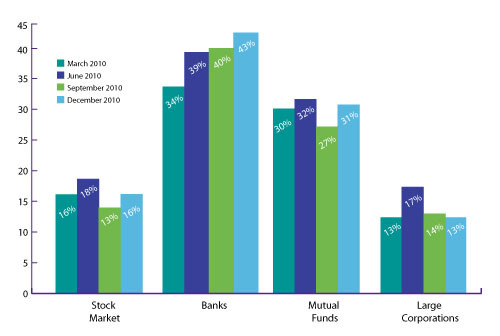 According to the latest data, trust in the stock market continues to show dramatic improvement; in fact, 21 percent of people surveyed want to increase their investments in the market versus 14 percent in September 2010. Similarly, only 11 percent of investors now believe a significant drop in the market is very likely, down from 16 percent just three months ago. 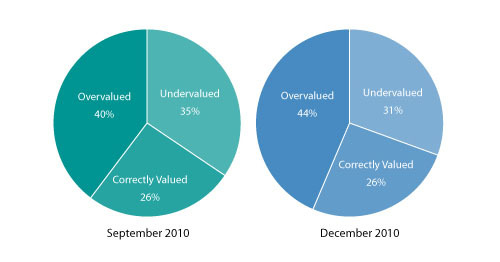 The researchers also found a slight increase in the number of Americans who see the market as being overvalued (from 40 percent in September 2010 to 44 percent now), while fewer now view it as undervalued (35 percent in September 2010 to 31 percent in the most recent quarter). Trust in banks has also gone up from its lowest point of 33 percent two years ago to 43 percent today. As in previous waves of the Index, the researchers explored attitudes toward strategic default, whereby homeowners are willing to default when the value of a mortgage exceeds the value of their house. Sapienza and Zingales noted a shift in attitude toward accountability: 58 percent of homeowners said they now believed lenders would pursue those who default on their mortgage, versus 53 percent in September 2010. And, the increase was more apparent in recourse states. Homeowners are steadily gaining more confidence in the housing market and real estate prices compared to previous waves of data. 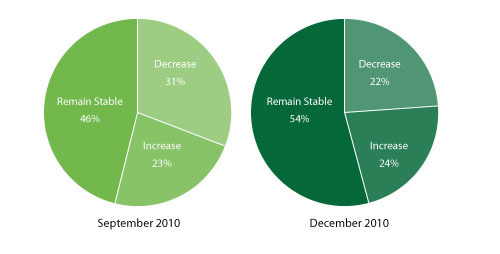 For example, 54 percent of people surveyed this quarter forecast that prices will remain stable, a sharp increase over 46 percent in September 2010. Similarly, fewer respondents (22 percent) now believe that home values will decrease during the next 12 months (as compared to 31 percent three months ago). ABOUT THE SURVEY: On a quarterly basis, the Financial Trust Index captures the amount of trust Americans have in the institutions in which they can invest their money. The survey is conducted by Social Science Research Solutions (SSRS) using ICR's weekly telephone omnibus service. As part of the most recent wave, a total of 1,003 individuals were surveyed December 15 through December 21, 2010. The institutions considered in the survey are banks, the stock market, mutual funds, and large corporations.